I don’t know about the devil, but there’s meaning in the details. I come from a family of natural-born storytellers. I am not aware of any of them having formal training; it is a talent. When I think back to family gatherings when I was young, I mostly remember the grownups sitting around the kitchen table or out on the porch telling stories. I’m sure my mother would rather some of us kids didn’t hear some of those stories but that was the chief entertainment. Most of the stories were tales from childhood and were told to humorous effect. A good storyteller is able to hold your interest, build suspense, pique your curiosity, make you laugh, and deliver a satisfying payoff at the end. They accomplished this by their voice and gestures in the delivery, but also by arrangement of the story. They wouldn’t simply recite the facts in strict chronological order—this happened, then this happened, then that happened. They would arrange them to the effect they wanted and they would emphasize certain parts over others. A good storyteller can make a mundane occurrence interesting and a bad storyteller can make the most exciting incident unbearable. A sizable portion of the Old Testament is historical narrative, or story. I don’t mean story in the sense that it is made up, but story refers to the narrative structure of the account. The stories in the Old Testament are there for a reason. They are intended to teach us (Romans 15:4; 1 Corinthians 10:11). The structure of the account, what’s there, what’s not there, and the emphases made are all guides to the intended meaning. Our first concern with every passage of Scripture is to find out what it means in its original context. That is true regardless of whether it is historical, prophetic, poetic, or didactic. Finding original intent can be very challenging in historical narratives of the Old Testament. Many preachers err at this point with Old Testament story. They use them for analogy or illustration without giving any attention to what the story means. I was at a conference many years ago and listened to a preacher take an obscure Old Testament passage and proceed from it to preach a message about the New Testament church. I remember after the message someone remarked that they never knew that [Old Testament story] was about the church. I could only respond that the Holy Spirit never knew it either. What that preacher did was make an analogy between that story and the church. He said true things about the church but the problem was that he didn’t preach it as analogy but presented it as what that story meant. I would say to such preachers that they’re obviously clever and creative. They have been gifted by God, but they should always subject their creativity to the text and never subject the text to their creativity. It can be legitimate to make an analogy or illustration from an Old Testament story, but preach it as an analogy and not as what the passage means. And, by all means, know what the story means in its original context. So I want to consider an Old Testament story for an example. I’m not going to do an exposition of the story but rather I want to point out some of the story structure aspects and maybe give you some help in asking the right questions and noticing the clues in the account. Judges 19 is one of the most disturbing accounts in Scripture and it’s not familiar to us. One of the first clues to the significance of the story is the length of it. It takes a while to unfold and lead to the civil war in chapter 20. So it has our attention, how do we determine its meaning? First, you want a big picture view. What’s the connection to the story before this one and after it? You need to know somethings about the book the story is in. What kind of book is it? What is the main theme of the whole book? What are the main divisions of the book? Where is this story in the book? In this case, Judges is structured in three main sections. 1:1-3:6 is introductory and provides a quick summary of the failure of Israel to complete the conquest of Canaan after the death of Joshua. 3:7-16:31 is the main section of the book and gives the account of the judges, who were deliverers of the people from the pagan nations who were afflicting them. 17:1-21:25 is the final section of the book and these chapters differ significantly from the rest of the book. There are no judges and no threats from foreign nations. These accounts are all inside Israel. 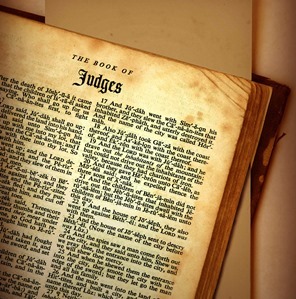 When you dig into the chronology of Judges, it is not at all certain that the events of chapters 17-21 happen after the death of the last judge. So why are these chapters placed where they are and what does that tell us about their meaning? If we consider just this last section of Judges, we find it also divides into three main parts. Chapters 17-18 begin the section with religious sins in the form of idolatry and corrupt worship. Chapter 19 proceeds to narrate an account of the grossest immorality within Israel. Chapters 20-21 tell of the bloody civil war where the tribe of Benjamin was nearly wiped out and the unjust reconstruction they suffered at the hands of the other tribes. This section reveals a connection and a progression. Chapter 19 gives a picture of moral failure down to the man-on-the-street in Israel. It’s not about leaders or international politics. It deals with marriage, hospitality, and uncommon lust. The main nasty business of this story happens in Gibeah, but it takes a while to get there. From verse 3 to verse 10, we are stuck in Bethlehemjudah. This part of the story is so fascinating because it seems so un-fascinating. It seems monotonous and why does it take so long? The Levite has gone to Bethlehemjudah to recover his wife from her father’s house and day after day he tries to leave and his father-in-law convinces him to stay. It takes eight verses to say what could have been said in a couple of sentences. Why? Well I’m not going to do all the heavy-lifting for you but hopefully this has been helpful to how to approach Old Testament stories. One other thing I would mention is to pay attention to what things are emphasized in the story. For instance, in Judges 19:1-20:6 the Levite’s wife is called a concubine ten times. Why is that emphasized? The fact they were married is emphasized also by reference to the Levite being a husband twice, the Levite’s father-in-law three times, and the Levite being a son-in-law once. It certainly seems there’s something significant being said. Happy studying.